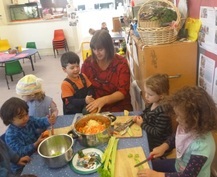 ​I am passionate about providing an environment where children can explore – I love it when children try things out, make discoveries and establish working theories. Learning should be a fun and positive experience to encourage lifelong learning. I have been volunteering at Crossways Creche since 1991 and recently celebrated 25 years of service. I help oversee the kitchen, meals and housekeeping - making morning tea and matching lunch boxes to their owners are some of my daily tasks. My arms are always open for anyone who needs a hug. I have become the keeper of the history about this place, remembering all who have passed through, the people of Crossways Creche make my day fun. It is my great pleasure to be able to come to creche as a volunteer, I have been coming once or twice a week since 2007. Before retiring I worked in early childhood in Sydney and with children with special needs. 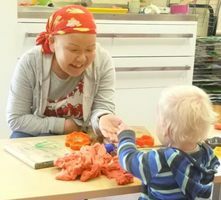 I find volunteering a wonderful way to enjoy interactions with young children and their families, and to use my teaching skills (I do not miss the paperwork).